I am very excited to start decorating the house for the Holidays, it's one of my most favorite times of year (a little behind this year, or so I feel since Dec is tomorrow!!!)!!! I love all the little touches sprinkled around the house, little vignettes of goodness! 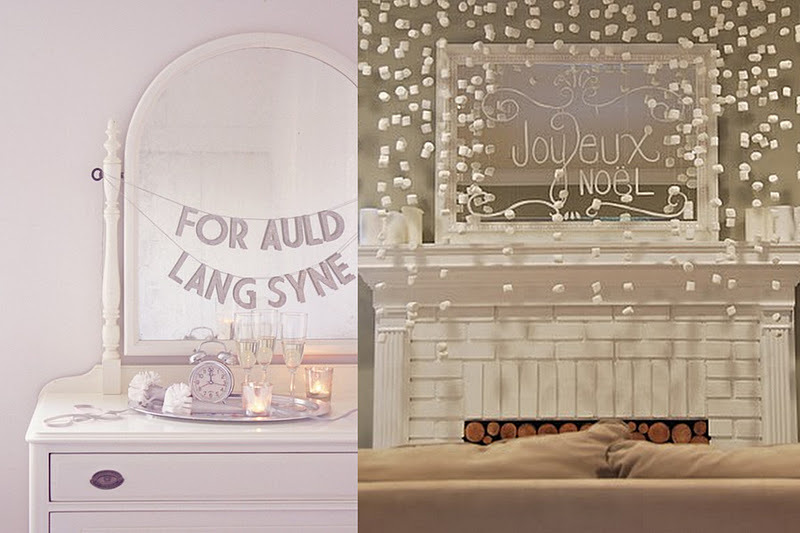 This year I want to keep with a similar theme as last year - cream, ivory, sparkle, white and gold. However I've had a weird feeling this year - I don't really want a tree. I can't pin point why but it'll be the first time in years. But then I started asking myself - do you need a tree to be festive? 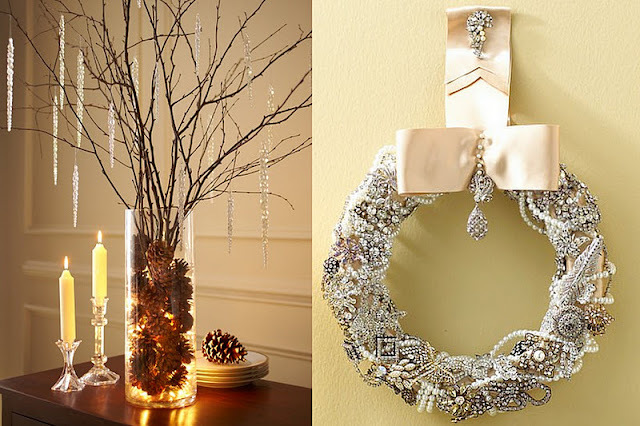 With Wreaths, Garland, Sparkly lights & White. And when in doubt add more sparkle?! Right???!!! We have a tall vase just like that and a great expanse of counter in our open living room/kitchen combo..... Who know's if I'll end up with a tree, but you can sure bet there will be lights and sparkle and ornaments every where until I decide!!! And I'll be sure to share!!! Have you gotten/getting a tree? Anyone else feel this way? 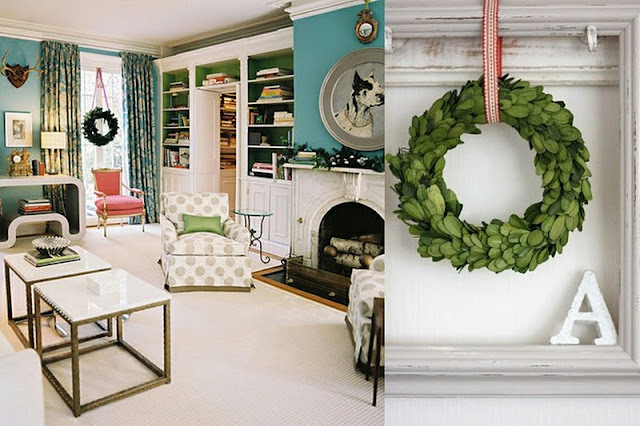 **You can see last years Holiday Decor here. And want to catch up on a comical tree buying experience of mine....read this (I still laugh and shake my head!)! I love these fun, sparkly decorating ideas! Anything with sparkle!! I love all of your inspiration shots. You can def don't need a tree to be festive. 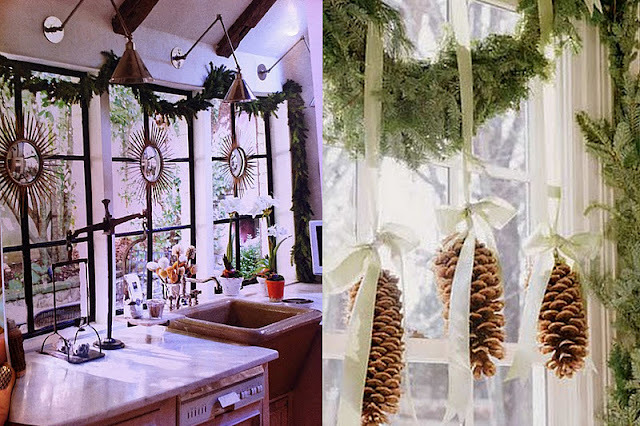 Wreaths and sparkle and garland are easier, not as messy, and just as festive! Love these ideas! We usually get a real tree, but didn't last year and our place still felt perfectly festive - I used the ornaments we typically put on the tree everywhere else (in vases, hung them of branches in a vase...). However, this year I think we are going back to a real tree so maybe I did miss having one! I haven't gotten anything for decorations yet!! I'm going to get a fake tree soon. I love sparkly things! I'm getting a real tree! It perks me up during the holidays, the smell, the look, the feel. I love Christmas. I love that wreath, it is so beautiful. I love the idea of a white christmas... Inside!